I want to tell you about a gift I once received and the impact it had on me – which had nothing to do with the gift itself and everything to do with the way it was given. 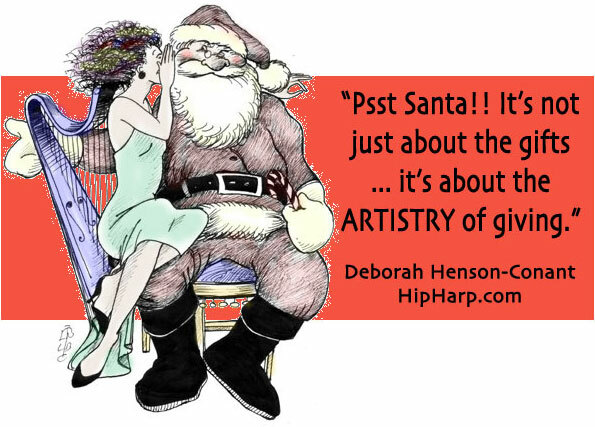 But first – Harp Players – let me tell you that I’m doing a webinar this Sun. Dec. 17th at 2:30PM EST, called The ARTISTRY of Giving. It uses the 7 principles from my upcoming “Strings of Passion” program to help you express yourself as you give whatever you’re giving during this Holiday season. Registering gets you a replay link if you can’t make it to the webinar. Years ago, as I sat on the bed the morning of my birthday, watching my boyfriend get ready to head out to work, he reached into his backpack, pulled out a pair of brown gloves, tossed them across the bed saying, “Oh I bought you a present” and they landed in a lump in front of me. I’m sure his intentions were great – but the way the gift was given devastated me. All I saw was a brown pair of gloves tossed at me as a seeming after-thought, which resonated with my own secret fear that I was just an afterthought in his life, a non-descript brown pair of gloves tossing away my own future as an artist. Was I projecting? Yes. Based on my own inner landscape. Could he have guided me to another landscape of experience? This same physical gift would have had a meaning so deep, reaffirming and filled with love, that I likely would have cried from joy. It’s possible he meant all that. It’s possible he hoped I’d experience it – but it’s not how he expressed it, and it’s not how I received it. Was he a total jerk? No. He was a loving, thoughtful person who had difficulty expressing his feelings directly. His impulse was loving, but the expression of that love didn’t get through to me. Am I dense? Maybe. But the result was that I didn’t experience the meaning of his original impulse and instead I took away a very different message. This happens to all of us – that the initial creative impulse we have can lose its emotional impact through fear of expressing ourselves — and if we express it at all, the message can be so unclear that others take away a completely different message. The result is that our impulse may completely lose the impact we intend depending on how we express it. I think about impulses and their expression a lot. In fact, “Impulse” is the first string in my “7 Strings of Passion” program – and it’s the spark that begins any creative journey of expression. My online program “Strings of Passion” that starts in January is all about how to support a creative impulse from that moment of impulse through to lift-off – the moment when it connects. That creative journey can sometimes take years … or it can be a tiny journey. And a tiny journey is a way to practice a larger journey. The impulse of giving is in all of us, but the ARTISTRY – the chance to practice the artistic process in this tiny way many times over this holiday season – can have a huge effect on how our impulse actually connects with others. Join me. I’ll be guiding you through the process – using the 7 Strings of Passion – and my harp, since music is part of MY artistry.